Simon Gipson, principal of St Michael’s Grammar School, located in St Kilda, Victoria, announced on Tuesday that he will be stepping down at the end of 2017. 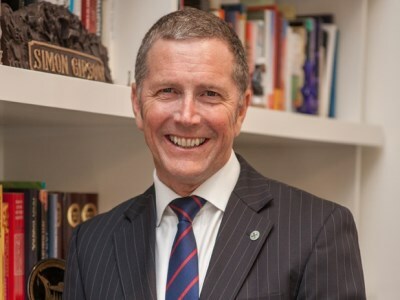 In his rich and varied career in education, Gipson has been tasked with such challenges as redesigning the Thai curriculum via an $80m school project, restructuring a 120-year-old school in Perth and embarking upon a transformational mission at St Michael’s Grammar, where he has taught for 16 and a half years. Looking back on his experiences, Gipson told The Educator about the powerful lessons he has learned through taking risks, leading with vision and effecting change through staying true to the values he holds dear. “We underestimate the importance of risk and challenge in learning, but we really only learn when we take that existential step into the unknown. In so doing, we tend to learn what we’re capable of,” he said. Gipson said he was concerned that education, and society in general, appeared to be “delimiting the opportunity for safe risk-taking for kids”. “We live in a risk adverse society where we’re so concerned about something going wrong that we reduce the possibilities of something going right. Moments of great innovation occur when we take risks, and an important part of this is basing these risks on your set of values and starting from there,” he said. One of the most important personal lessons I’ve learnt is the importance of value. If you do things for the right reasons in alignment with the espoused values of the organisation, and you act them out authentically, then at the very least, every decision you make, you can live with and know is right. Gipson said that, when reflecting on Australia’s education model at large, such values are not being communicated strongly enough. He believes that an overhaul of the current ‘archaic’ system is necessary to drive the change that he says is needed. “One of the great challenges we face as educators in the 21st century is that we operate on archaic 19th century organisational models. If you think about it, the division of primary to secondary to tertiary are really historical legacies that have long outlived their legitimacy,” he said. Gipson said that while the ATAR still largely determines students’ future opportunities, the proliferation of opportunities for online learning are “totally independent of the whole structure” and play no real part in the accreditation structures for learning. “I’ve tried to get in politicians’ ears about this for a decade, but it’s very hard because so much of the political agenda seems to be about tinkering around the edges rather than addressing the fundamental issues about our education,” he said. Gipson suggested that rather than envisioning the types of schools we want to see in 10 years, we instead focus on the question of what kind of learner and citizen we would like to see, and what skills they should require. “We have to recognise that we have an incredibly inefficient and ineffective structure of education that flies in the face of what research has been telling us for years,” he said. Gipson added that he was concerned about educational equity in Australia’s schools, adding that the debate needs to shift away from ‘private vs public’ and towards a conversation about how to provide more opportunities for students, regardless of socio-economic status. “The demarcation is wrong and that we need to think very differently and conceptually about schools. The system needs a fundamental overhaul, but I understand that this would mean an extraordinarily complex and resource-intensive task that very few are prepared to tackle,” he said. “I strongly believe that every child deserves to have the sort of learning opportunities that a school like St Michael’s provides, and it shouldn’t be only kids with wealthy families who can send their kids here. Every kid should be able to access the sorts of quality teaching and learning at a school like St Michael’s Grammar. In 2012, Gipson became the first principal to be awarded the Lynda Grattan Business Award – an accolade he said showed that principals were not only instructional leaders in education, but also skilful business managers. “For me, getting that award was a thrill, because it was an acknowledgement from an organisation external to education recognising the role of principal. The notion that principals are simply teachers who are good at their job is anachronistic,” he said. Gipson said that the most significant change he has identified in the role of principal over the years is that of increased administrative work. He said this is putting immense pressure on principals who are already tasked with one of society’s most difficult jobs. “From my perspective, the biggest change has been around the business side of the job – without question. There has been a significant rise in legislative and regulatory demands. I’ve lost count of the number of regulatory bodies to whom we must respond as an independent school,” he said. To help with these challenges at his school, Gipson appointed a director of business who has oversight of finance, property, ICT and risk mitigation. “This helps the school deal with all these areas in an efficient way. The more efficiently we can run, the more resources we can direct to teaching and learning. However, he acknowledged that not all principals have the luxury of such a ‘middle man’ to oversee this vast range of responsibilities and that there needs to be a much greater level of support for principals who are starting out in their role as well as to mentor principals who can support them. “For all people who are in a position of management and responsibility, there needs to be an acknowledgement of the specific techniques, tools and skills they require to do their job,” Gipson said. Gipson said that principals are “vastly underpaid” for the work they do, adding that the role is not unlike that of a CEO. He pointed out that his school has an annual budget in excess of $40m, 1,300 students and more than 300 staff, effectively making it a sizeable corporation. “Principals have to be across technological innovations, issues of risk management, disability, disability, discrimination legislation, industrial relations and run the school as an effective business in which we have extraordinary pressures on keeping costs down,” he said. “At the same time, there is a constant ideological debate about the place of independent schools in Australia. At times there is skewed and at times unpleasant media positioning that suggests that schools like St Michael’s are inappropriately overfunded – but this is totally removed from the truth. Perhaps one of Gipson’s most enduring legacies will be a new $20m building that St Michael’s recently opened. Gipson said the new facility has a strong focus not just on K-12 learning but the school community as a whole. The facility, which has a range of blended and flexible learning areas, enables students as young as three to be learning in spaces adjacent to students who are 18. “We recognise that students do learn differently and we need to be much more adept at differentiating our provision of learning. Rather than having cell-like classrooms, we have areas that recognise all types of learning styles,” Gipson said. The bottom floor of the building is a café – named in honour of the school’s first student, Dolly Ziebell – which provides the school’s staff, students and parents with a broad space to meet, share meals and work together as a single community. “We wanted to create a space that was welcoming to all members of our community, because I believe that schools for the future need to be centres for their communities. Let’s face it – most of the conventional agencies that formed physical communities are long gone,” he said.